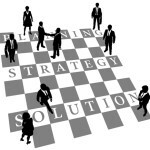 Strategy consulting for private and public organizations (companies, governments, ministries, all kinds of organizations). Game theory can be applied to a variety of applications and helps when strategic actors influence each other in terms of business questions, consumer behaviors, political issues, resources, project management, social behaviors, and other aspects. in which various actors compete with each other and search for the best solutions and recommendations for action. We formalize your situation and seek science-based strategies and solutions, for example, based on methods of Nash equilibria, minimax algorithms, elimination of dominated strategies and modeling of uncertainty, utility and preference functions. You’ll not be misled by abstract terminology! All formalizations will be easily understandable. A mandate is rejected if we already advise your competition.